There are many things we need to survive: nutritious food, clean water, clothing, health care and a safe place to live. But in Malawi, many poor families struggle to get what they need. 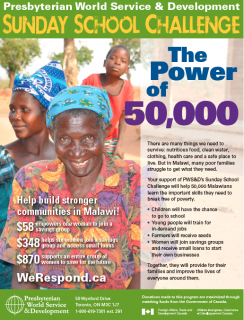 Between 2011 and 2017, PWS&D’s Building Sustainable Livelihoods program* is helping 50,000 Malawians learn the valuable life skills to break cycles of poverty. Together, the power of 50,000 will provide for their families and improve the lives of everyone around them. By taking the Sunday School Challenge, your gifts will build stronger communities in Malawi! To accompany the Sunday School Challenge, PWS&D has a new educational resource! Five engaging activities will help teach youth (grades 4 +) about necessities and how a livelihood can help alleviate poverty. It will also remind youth about the importance of sharing our gifts with those in need. Download the Sunday School Challenge flyer and Educational Resource, or order a printed copy by contacting Anna Muir (amuir [at] presbyterian [dot] ca, 1-800-619-7301 ext. 293). * Donations to the Building Sustainable Livelihoods program are matched 3:1 by Foreign Affairs, Trade and Development Canada (DFATD).